[September 13] Health care has responded to the Global Climate Action Summit’s call to “take ambition to the next level” by committing to power 1,200 health facilities with 100 percent renewable electricity. In making this commitment, health care is joining thousands of cities, companies, higher education, and other organizations making similar commitments as part of a worldwide effort to accelerate the transition from dependence on fossil fuels to an economy based on clean, renewable energy such as wind and solar. 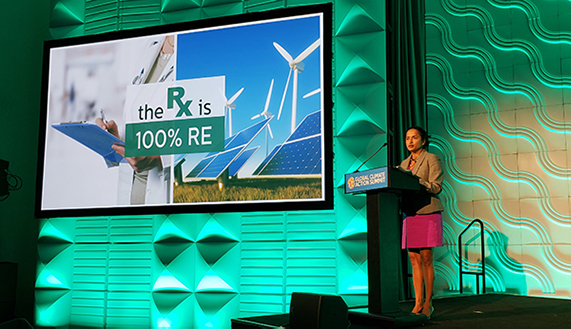 In the session “Our Clean and Renewable Future,” Dr. Aparna Bole, Health Care Without Harm board member and University Hospital’s division chief for general pediatrics and adolescent medicine, announced commitments by 18 health care institutions, representing the interests of more than 1,200 hospitals and health centers in 10 countries, to implement 100 percent renewable electricity in their facilities. 100,000 (U.S) homes’ energy use for one year. The group of hospitals includes leading health systems with large carbon footprints from the United States such as Kaiser Permanente, University of California Health, and Partners HealthCare, as well as similar institutions in Spain, the Netherlands, and Morocco. In the Netherlands, Radboud University Medical Center will be serving its community with 100 percent renewable electricity by 2024. By working with a local partner, they will be able to secure over 85 million kilowatt hours of electricity from renewable sources. By harnessing the power of the Moroccan sun and geothermal energy, Centre Hospitalier Universitaire Mohammed VI in Marrakech is committed to running its facilities on 100 percent renewable electricity by 2030. This will reduce their annual greenhouse gas emissions by over 7,000 metric tons of CO2e. The group also includes small health centers in Uganda and Nepal whose deployment of renewable electricity is part of a growing movement to build health care resilience and greater community access to health through renewable electricity. Transitioning away from coal-fueled power sources has been shown to generate immediate health benefits, and hospitals and health centers worldwide are increasingly choosing renewable electricity in order to protect their patients from toxic air pollution as well as the adverse health impacts of climate change. *University of California (UC) Health kilowatt usage includes both health systems and campuses. For health systems that did not provide projected CO2e emissions reduction, the emissions were calculated using the EPA Center for Corporate Leadership Simplified GHG Emissions Calculator based on their eGrid region.